The Web site of Telecom, one of the two cellphone networks in New Zealand offering Apple’s new iPhone 5, advertises the device as “the thinnest, lightest iPhone yet.” Could this really be the best they could manage to say about the latest release of the most successful smartphone in the short history of smartphones? I had to find out. I wanted so badly to be impressed by the iPhone 5. I remember well — it was only five years ago — the excitement that surrounded the unveiling, and eventually the release, of the original iPhone. I remember bringing mine home from the Apple Store where I used to work, the unwrapping, the anticipation as I opened the box to reveal the elegant packaging — the entire process was almost sacramental. Since then, I’ve owned three more iPhone models (I skipped the iPhone 4). Even now, every time a new iPhone lands on my desk, there remains something a little special about the act of opening it — there is, after all, a reason why unboxing videos proliferate across the internet. The iPhone 5 continues this tradition, its packaging crafted almost as carefully as the device itself. Out of the Box and into the Hand — This time, a review unit of the iPhone 5 arrived courtesy of Apple New Zealand. The packaging, I noticed, was a bit longer and deeper than previous boxes have been. One look at the iPhone 5 suggests a possible reason. It’s tall. Placed next to my iPhone 4S, it looks noticeably longer, and its height also makes it look narrower, despite having the same width. At any rate, its appearance is something of a departure from its predecessor’s. From the front, it looks quite similar, dimensions notwithstanding, but from the side the differences start to show up. The metal bezel that surrounds the iPhone 4 and 4S models has been, at least in the black model Apple sent me, coated with black powder; there have been reports of the iPhone 5 looking scuffed and with powder missing out of the box, but my sample has no such flaws. As we would expect from Apple, it looks, and feels in the hand, rather elegant. The iPhone 4S’s glass back has been replaced with aluminum, again quite stylishly powder-coated, with two black glass strips, one at the top and another at the bottom, to provide radio transparency for the iPhone 5’s various antennae. In the hand, it feels very light — almost insubstantial. While Apple did the right thing in abandoning the plasticky feel of the iPhones 3G and 3GS, the thinness and lack of heft of the later models leaves them feeling slight. 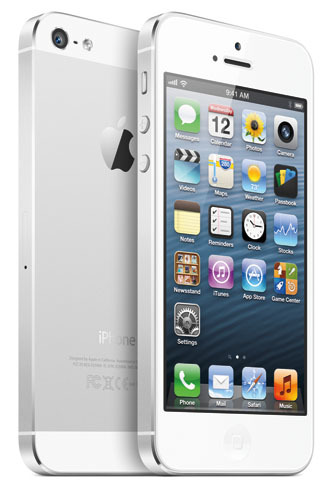 If the iPhones 4 and 4S felt lightweight, the iPhone 5 is positively sylph-like. That said, the impression of lightness doesn’t really last — you become accustomed to it quickly. Lightning Strikes — Next out of the box is the new eight-pin Lightning cable, and here again is a major change. Since 2003 and the third generation of the iPod, a proprietary 30-pin dock connector has become standard across not just Apple’s range of iDevices, but also across an entire universe of third-party accessories. Apple’s decision to abandon this entrenched technology in favour of the new Lightning connector has upset a large number of people who have invested in docking stations, speakers, and cradles that use the old 30-pin connector. The new Lightning connector is surprisingly small, comparable in width to a micro-USB plug, but rather thinner and flatter. Its primary benefit to the user is reversibility; it can be inserted either way round, makes for easier insertion in the dark or without looking. I presume the benefit to Apple lies in freeing up the internal and external space previously occupied by the dock connector and related electronics when designing iOS devices. (At least with devices like the new iPod nano, the small Lightning connector feels worthwhile, as opposed to the minimally different MagSafe 2 connector used in the last generation of MacBooks.) It’s also likely that the new connector will make possible other capabilities, such as USB 3.0 speeds (the iPhone 5 is still limited to USB 2.0 performance). This is a major change for the entire Apple ecosystem. Anyone who owns a speaker system, a dock, or even a charging cable for an existing iPhone and who hopes to use it with a new iPhone 5 will either have to buy an adapter from Apple (useful for chargers, perhaps; less useful for in-car systems and cradle-type devices), or replace said kit, which may not even be possible for some time, given that even Apple is having trouble keeping up with demand for the standard Lightning-to-USB cables, along with the $29 Lightning-to-30-pin adapter and $39 Lightning-to-30-pin cable adapter, plus the $49 HDMI and VGA adapters. Since there’s an authentication chip in Lightning cables, there will likely be no unlicensed Lightning options that provide full functionality. In the end, the 30-pin connector had a long run, but it’s not surprising either that Apple would want to move to something smaller or that Apple would create a custom connector in favor of using something standard, like micro USB. (A $19 Lightning-to-micro-USB adapter is available as a separate purchase, in part to comply with European laws that require all phones to be able to charge using that plug format.) Nor is it surprising that Apple would cut over so completely, even when the benefit to users is relatively small. The main misstep seems to have been Apple’s inability to provide sufficient quantity of the various cables and adapters, and the lack of even licensed third-party accessories for the iPhone 5. 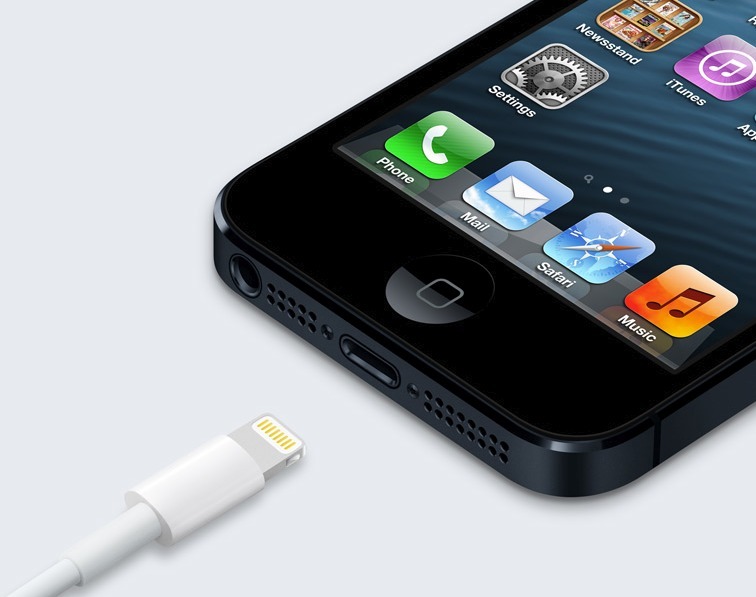 The smaller Lightning connector enabled Apple to move the headphone jack to the bottom of the iPhone 5. I have yet to see an explanation of this change; it seems entirely gratuitous, at least from the user perspective. Having the headphone jack on the top of the iPhone made sense to me at least. When my iPhone 4S is in my shirt pocket, its usual out-and-about home, I can plug in a headset and still have the phone right-way-up in my pocket, and when an alert calls for my attention, reading the display is quite easy. Similarly, when I’m driving, the iPhone 4S sits in a cupholder, connected to my car stereo via the top of the phone. The relocation of the audio jack to the bottom means that the iPhone 5 sits inverted in the holder, which isn’t as convenient as I’d like. The main use case I can think of that might support the bottom position is dropping the iPhone 5 into a trouser pocket, where it makes sense to have it top-down and face-in (thus exposing the bottom-located headphone jack), so it is properly oriented in your hand when you pull it out. I suppose there may also be people who make FaceTime calls while using earbuds; the bottom position might be better if you’re holding the iPhone 5 out in front of you. The remaining item on the bottom of the iPhone 5 is the speaker, which is a bit louder than the iPhone 4S. Whether or not it’s noticeably better sounding is a different matter but the amount of sound it can pump out is impressive. More Pixels, Scotty! — So let’s turn the iPhone 5 on, and see how it works. Well, it’s an iPhone. All the traditional iPhone features I’ve come to expect are present. The screen, of course, is the first major difference, and it looks good. The colours are richer, more saturated, than they were even on the iPhone 4S — a screen that still looks very good. But the major draw is the size of the screen. Apple has extended it vertically, enough to add an extra row of app icons on the iOS home screen. This is certainly welcome, but it’s not exactly revolutionary. In fact, another row of app icons, and folders being able to hold more apps, does help the significantly overloaded home screen interface, but seeing an extra email message in a list, or being able to read a bit more of an ebook before I swipe to the next page, hasn’t made that much of a difference to my user experience. Watching video is likely the main reason for the change — the screen’s proportions now match HD video, and videos can be viewed full-screen, without letterboxing, a notable improvement. Letterboxing is precisely what happens when an app’s developer hasn’t yet caught up with the new hardware. Many apps have already been updated to take advantage of the larger screen, but there are plenty that still think they’re running on an iPhone 4S; the iPhone 5 simply displays these apps in the centre of the screen, with black bars above and below. The black bars are black enough that you seldom notice, and regardless, all apps in active development undoubtedly will be updated for the new screen size soon. The larger hardware, for me at least, is quite comfortable to use. I tend to use my iPhone two-handed, supporting it in my left hand while operating it with the fingers of my right; for me, then, there is no significant difference between this iPhone and the last. Some women I know have complained that the iPhone 4 form factor was hard enough to fit into the pockets of women’s clothes; the iPhone 5’s extra height will make that all the harder. And of course, all iPhone 5 owners who want cases will have to purchase new ones; there will be a plethora soon. Camera, Network, and Battery — By the time I had charged and synced the phone, the weather had cleared up, so I went outside to play with the camera. The camera on the iPhone 4S has been very well-received, and Apple wisely refrained from tampering with the 4S’s camera; the iPhone 5 sports basically the same hardware. I took a couple of photos of my wife’s cat, holding my iPhone 4S in one hand and Apple’s loaner iPhone 5 in the other for a literal side-by-side comparison. On the iPhones’ screens, the iPhone 5’s images were noticeably richer, but when I compared the photos from both devices in iPhoto on my laptop, there was little appreciable difference. 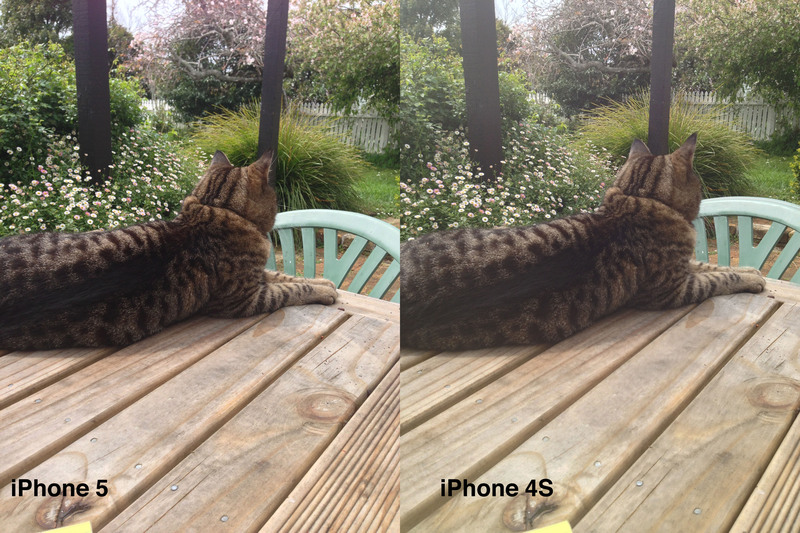 The iPhone 4S’s camera was very good; the iPhone 5’s essentially identical camera is every bit as good. Video, similarly, is comparable in quality, with the addition of somewhat improved stabilisation, thanks to the iPhone 5’s beefier A6 chip. I have so far avoided mention of Long-Term Evolution, or LTE, the absurdly fast cellular-data connectivity protocol that Apple finally incorporated into the iPhone 5. (LTE is often referred to as 4G, though “4G” is now somewhat meaningless from a technical standpoint.) That is, alas, because I have no way to test it. I have the enormous good fortune to live in New Zealand, but paradise is not perfect. As I have whinged about previously (see “Paying by the Bit: Internet Access in New Zealand,” 15 January 2010), Internet connectivity in New Zealand is not all it might be, and LTE is no exception. Neither Telecom nor Vodafone, Apple’s two resale partners and the two main cellphone networks in New Zealand, nor indeed 2 Degrees, their only rival, have, or have plans to build, a 4G network in New Zealand. Thus fast networking remains a feature available only to those users who happen to live in markets — the United States, the UK, even Australia! — that happen to have 4G connectivity. That said, I’m told that when you combine the iPhone 5 with an LTE-enabled carrier with sufficient backhaul bandwidth and not too many other users, the performance is quite impressive. In the tests of Wi-Fi and 3G cellular data I was able to perform, the iPhone 5 and 4S performed identically. At the end of all this testing, there was one more thing to look at. My iPhone 4S has, for all its many fine features, one serious weakness: its battery life. I complained about this in “Apple’s International Obfuscation” (28 June 2012), and I was hopeful that the iPhone 5 might have the solution. I question iOS’s usage reports because while watching it today, it reported 6 hours and 14 minutes of use since last full charge, but it hasn’t even been that long since I unplugged it after waking up this morning. Nevertheless, with what seems like reasonable usage, mostly on Wi-Fi, with Location Services on for a few apps, but Bluetooth off, I’m down to 28 percent capacity remaining. From those who have been living with the iPhone 5 for some time, it sounds as though battery life is roughly similar to the iPhone 4S — sometimes a little better, sometimes a bit worse. For some it has been much worse, but that’s iOS 6’s fault (see “Solving iOS 6 Battery Drain Problems,” 28 September 2012). If I don’t sound entirely enthusiastic so far, then perhaps I should find something I can unreservedly endorse about the iPhone 5. 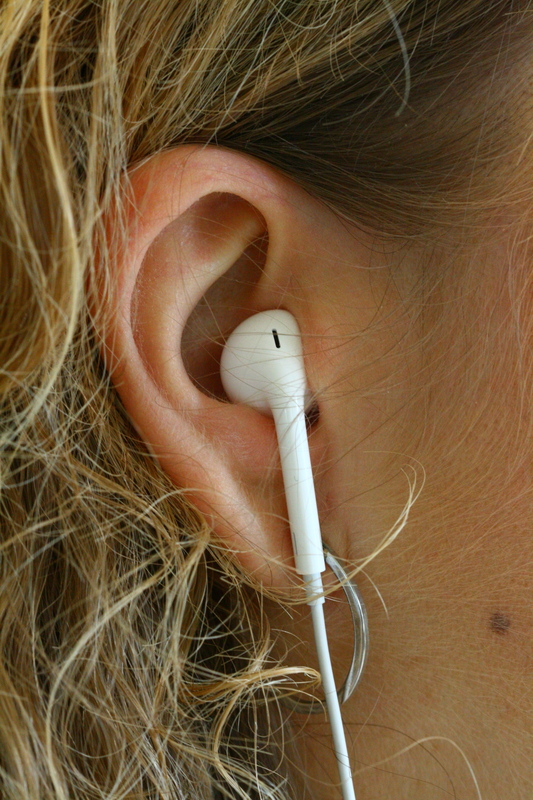 There is one outstanding enhancement that I can wholeheartedly praise, and that’s the new EarPods. They are, at least in my ears, quite considerably more comfortable than previous iPhone and iPod earbuds — I hardly notice their presence. Their sound, too, is a marked improvement. While they’re not quite up to the quality of my favourite Sony studio monitor headphones, they do reproduce a degree of detail and range that I have never heard — that I have never even expected — from iPhone earbuds. As I write this, I’m listening to the Rolling Stones’ “Stupid Girl,” from the 1966 album Aftermath, and I’m hearing details of Brian Jones’ acoustic guitar in my right ear that I don’t remember hearing before. The EarPods come in their own little plastic carrying case inside the iPhone 5’s box, although I suspect few users will have the patience to wrap them carefully back into the case after each use. The case is also their retail packaging; yes, one of the most attractive and appealing parts of the new iPhone isn’t even part of the iPhone, but an accessory that can be bought separately for $29. Worth Upgrading? — I’ll be returning the iPhone 5 to Apple soon — sadly, they want it back. It’s always fun to have the latest, shiniest kit, and I’ll miss it for sure, but going back to my own iPhone 4S hasn’t been at all troubling. If I didn’t have another year left on my Vodafone service contract, I might consider upgrading, but I simply don’t find enough in this new release to make it a compelling upgrade from the iPhone 4S at this stage. Were I upgrading from an iPhone 4, which lacks Siri and doesn’t have as good a camera, the iPhone 5 would be more attractive, and moving up from an iPhone 3GS or earlier model would be even more compelling. For anyone in the market for their first iPhone, or replacing a broken iPhone, the iPhone 5 is hard to beat, with the main competition coming from the $99 iPhone 4S and the free iPhone 4. Put simply, the iPhone 5 is the best iPhone Apple has ever produced, but its improvements are worth only $100 (the price difference to the iPhone 4S, which does have a comparable camera and Siri). That’s entirely intentional on Apple’s part, as Glenn Fleishman noted in “Incremental Change Wins Apple Big Gains” (29 March 2012). Despite what many seem to think (and a bit of what Apple implies in its marketing), Apple seldom releases new products that are revolutionary, and the iPhone 5 is no exception. It’s a great smartphone, and the best iPhone ever, but, at the end of the day, it still looks, walks, and quacks like any other recent iPhone. After reading many comments about the placement of the earphone jack at the bottom of the iPhone 5, I have concluded that maybe Apple was on to something. If you put the phone in your pocket head first (jack on top), it is actually easier, in my opinion, to reach for it and have it facing the right way when you take it out. The speakers will also be facing up rather down while in your pocket, making it somewhat easier to hear ringtones.